The primary unmasked once again the very real racial rift in Sanders’s support—and in progressive politics. I met Carol Tart at the opening of the Sanders campaign’s South Philadelphia office about a month before the primary. In a room filled with young people ornamented with tattoos and beards, and a handful of older white radicals, Tart, a striking woman wearing a stylish hat, was easy to spot. For one thing, she was the only African-American woman I could see. And no one was talking to her. So I went over and asked what had brought her to the event. 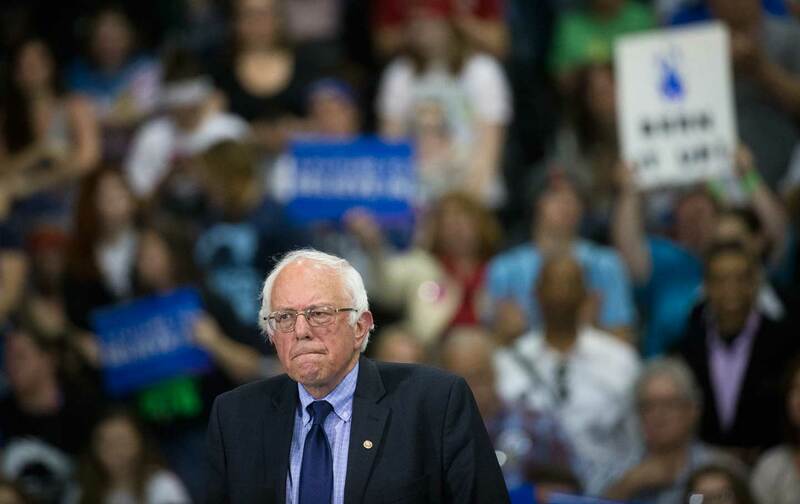 Pennsylvania was always going to be a tough state for Sanders. In 2008, when over 432,000 Democrats turned out in Philadelphia alone, Barack Obama got 65 percent of their votes. He still lost the state by 220,000 votes—giving Hillary Clinton, who had been questioning her opponent’s electability and attacking him as an elitist for calling some Americans “bitter,” a rationale for carrying on her campaign until the convention even as she struggled to persuade superdelegates to remain neutral and let the contest play out in May and June. Back in 2008 Hillary Clinton still owned a share in the family’s cottage on Lake Winola, near Scranton—the town where her father, Hugh Rodham, was raised. Both he and her younger brother, Hughie Rodham, played football for Penn State. So one way to look at what happened yesterday is that Pennsylvania was always Clinton’s to lose—and that she didn’t lose it. Instead, she methodically rounded up almost every Democratic elected official in the state—from Senator Bob Casey and Governor Tom Wolf (and former governor Ed Rendell) to the mayors of Pittsburgh and Philadelphia (along with former Philly mayor Michael Nutter, who also backed Clinton in 2008). The only prominent Democrat in the Sanders corner was John Fetterman, the mayor of Braddock—whose own campaign to win the nomination to take on the state’s Republican senator, Pat Toomey, fell short yesterday with just 20 percent of the vote as Katie McGinty rode a presidential endorsement and heavy backing from Emily’s List to victory. This was never a fair fight. Philadelphia has been a machine town, and Pennsylvania a machine state, since a young reporter named Lincoln Steffens made a name for himself exposing “the shame of the cities”—in 1904! And as both the Clinton and McGinty wins demonstrate, it remains a state where the machine still delivers. Though turnout in Philadelphia was 100,000 lower than in 2008, this time Clinton won 62.6 per cent. But the temptation to seek comfort in self-righteousness—especially now that Sanders no longer has a plausible path to the nomination—must be resisted. With its toxic towns—lead levels in Allentown are seven times higher than in Flint, Michigan; the water in Scranton has six times more lead than Flint; in Reading levels are five times higher—rusting railroads, abandoned factories and inadequate infrastructure, Pennsylvania is a vivid illustration of the needs Clinton’s incremental tinkering will never meet. Yet it is equally true that the people most desperately in need of help in Pennsylvania—whether they’re in Pittsburgh waiting for a bus that only runs twice a day, or in Bethlehem fighting to organize a union at Sheldon Adelson’s Sands Casino (built inside the carcass of what was once the country’s second-largest steel mill), or in Philadelphia, where the Carlyle Group want to bring fracked gas into an already polluting refinery on the shores of the Schuylkill River—are also those who can least afford a Trump or Cruz presidency. Sanders—and his supporters—have a responsibility to those people to keep fighting for a living wage, free public college education, truly universal healthcare, an environmentally and economically sustainable energy system, and an end to the endless wars of regime change that grind up so many men and women in the only jobs program embraced by conventional politics. None of those fights will be settled in Philadelphia, but none of them will be advanced by abandoning the field either. Sanders needs to come to the table with as strong a hand—and as many delegates—as possible. Yet it is precisely in his role as the head of a movement that Sanders’s performance in Pennsylvania was so disappointing. Not only because his “I stick my neck out for nobody” refusal to lift a finger to help John Fetterman suggested that when it counted, the campaign’s mantra of “Not me, us” was just an empty slogan. Or because, although the Working Families Party worked their hearts out for Sanders in Pennsylvania—organizing that paid off with victories in Lancaster and Reading—they, too, have no official claim on either the organization Sanders built up or the lists of contributors he amassed. (Instead of launching a crusade to take on the Democratic machine—a fight that will be essential if Sanders and his allies are to have any hope of moving the party to the left—Sanders kept his rhetorical fire trained comfortably on Wall Street.) But because the lack of attention paid to voters like Carol Tart was symptomatic of a campaign that relentlessly—and successfully—went after the working-class white voters that gave Hillary Clinton victory in the state in 2008, while never making a similar effort to win over African-Americans. Let me be clear about this: The Clinton campaign has done everything it could to paint Sanders’s supporters as “overwhelmingly white,” as part of a strategy aimed at denying both white and black progressives permission to vote for the candidate who was obviously far more progressive on almost every issue. Yet apart from the brilliant—but entirely unofficial—#BernieMadeMeWhite Twitter campaign, this strategy got very little pushback. Instead, Sanders kept scheduling rallies at college towns, and relying on white indie rockers to warm up his crowds. For a while—when he kept racking up surprise victories—that may have looked like a smart move. But now that Sanders isn’t going to be president, his supporters and the movement he leads need to grapple with the reality that black voters—in Philadelphia, but also in Hartford, Connecticut; Wilmington, Delaware; and Baltimore, Maryland—overwhelmingly continue to prefer the devil they know to a future they didn’t believe in. Because the truth is that even if it were possible to bring about a political revolution in this country without the full participation of African Americans, the result would not be a revolution worth fighting for or defending. So while there are many items on the Democratic agenda before Sanders—and his campaign—return to Philadelphia, my own view is that finding a way to heal the racial rift between the most reliable Democratic voters and the most progressive Democratic voters needs to be at the very top of the party’s to-do list.